Last week we made a difficult announcement to our team. Ben and I are no longer continuing as business partners. We launched Bean Ninjas almost 18 months ago and had built a brand, a team of 12 staff members and a community of almost 100 clients. I am buying Ben out of the business and will be moving forward as the sole CEO of Bean Ninjas. Not much! We’ve been working on a transition plan and over the past 2 months Ben has been handing over his responsibilities to me. Ben will continue on as a contractor for another 3 months to ensure we have a smooth transition. 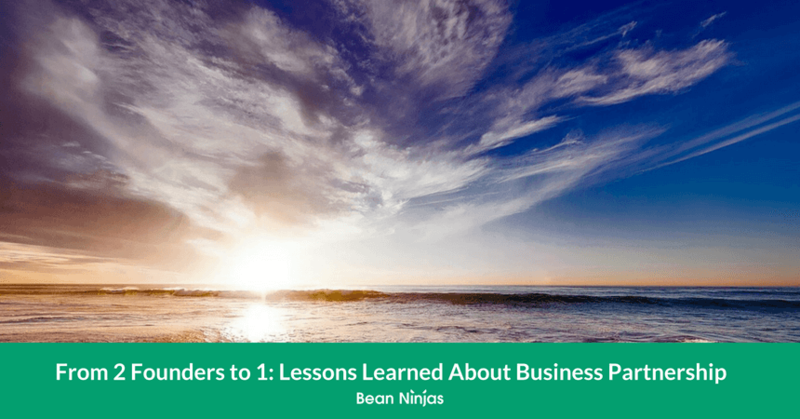 The purpose of this article is to inform clients, partners and friends of Bean Ninjas about the change in ownership; to share some lessons learnt when it comes to the challenges of business partnerships; as well as give some insight into the purchasing of a business. As business partners you go through lots of ups and downs and share many moments together. It’s almost like a marriage. We hit some difficulties with our partnership relationship towards the beginning of 2016 and have been working on them for most of the year. Ultimately we decided that we had different goals and were following different paths. It was better for us to separate amicably then to go down a path of disputes and unhappiness. Where were we different and why didn’t we identify this from the outset? Even though Ben and I are no longer going to continue as business partners I don’t regret having a business partner. Ben and I joined forces in July 2015. We launched in 7 days following Dan Norris’s 7-Day Startup methodology and Bean Ninjas was born. We spent some time before we launched documenting our co-founder agreement including clauses to cover the potential sale of the business in the future. We also talked about our goals and made sure that our interests were aligned. Our shared goal was to build a 7-figure business and work less than 20 hours per week. But as we discovered in time, our journeys to achieve this goal differed. As a father Ben had limited time available to work and also had to earn a certain level of income to provide for his family. This created a challenge in balancing his time spent growing Bean Ninjas, earning income from his tax practice and being a great dad. On the other hand I had another business which was fairly hands-off and could almost cover my living costs, no family to support and money to invest in the business. This meant that I wanted to grow more aggressively and spend a lot more time growing the business. So what did these different goals mean? When we launched Bean Ninjas, Ben and I didn’t have set roles or responsibilities. We both juggled bookkeeping, onboarded new clients, handled sales calls and wrote blog posts. Over time our roles developed and Ben looked after operations and I looked after marketing and relationships. We’ve maintained a growth rate of 10% month-on-month since we launched. This put pressure on our bookkeeping team and there were a number of times where our hiring didn’t keep pace with our growth rate. Ultimately this meant that turnaround times and response times weren’t met. To address this, in October we made a decision that I would come back and run the Australian operations of the business so that Ben could focus on the international operations and the upcoming US end of financial year. This gave me a taste for running operations again and also meant that I could implement some changes that I thought would improve our response times and profitability. What did we learn throughout this process? I’ve learnt that effectively managing a business partner relationship is very different to managing staff or having a good relationship with your boss. You need to have respect and be kind and honest with each other. There are a lot of resources available for managing high performance teams, but there’s not too many when it comes to business partner or co-founder relationships. You need to set up remuneration and equity in a way that it’s tied to performance. For instance, when one partner works significantly more hours each week, this needs to be reflected in the reward they receive. It is also important to have clearly defined KPIs for each partner and agree on a process for improving performance should any of the partners under perform. Whilst you can have two partners, it’s better for the business to have only one person taking responsibility for the overall direction of the business. This is particularly important when key decisions need to be made with regards to various areas of the business. A great CEO will value input from all other members of the team, and their success is dependent upon their ability to lead and collaborate well. I’m proud of the way Ben and I have negotiated our way through this business sale. Ben could have had an emotional response at my suggestion that one of us buy the other out. While initially he may have been disappointed that I didn’t want to continue the partnership, he was able to work through this and then come up with a sale agreement that resulted in a fair payout for him and a smooth transition for me as the sole founder. Ben plans to take some time off to enjoy with his family. You might see him in Germany or travelling around Europe in the future and also keep an eye out for his next business venture. As a partner you have to believe in your other business partner(s), look out for each other, and be prepared to work through challenging situations together should they arise. One of our biggest sources of tension and frustration came as a result of us taking on work that we shouldn’t have. It became evident that what I thought of as a well-oiled machine clearly wasn’t that. The most common complaint we’ve had from clients is that we have slow response times and it can take weeks for new clients to be onboarded. As I take on an operational role this will be one of the first things I will be working on. I’m now back doing all the scoping and onboarding work to get a feel for it again. I’ve also had input from all of our team leaders about where we can improve this and I’m busy implementing these suggestions. Our co-founder agreement included a section on how we would calculate the purchase price of an eventual sale. At the time we weren’t sure whether it was a good methodology or not, but it is common for accounting firms to ‘sell fees’ based on a multiple of their monthly client revenue. Earlier in 2016 we had interest from an investor. Part of that process involved getting advice from a number of different sources about how to value the business. This helped to affirm that our valuation method was similar to the market value. Part of our negotiation process involved understanding what each of us wanted from the agreement. Knowing that Ben’s skillset is accounting and tax we needed to word the non-compete so that he could continue to provide tax services without directly competing with Bean Ninjas. We found that when we were putting together the contract via a shared Google Doc it was easy to get in the wrong mindset. We’d then have a skype call and realise that we both wanted something that was fair and equitable and we’d find a way to make that work. Part of our process also involved putting together a handover plan. This was a list of things we needed to update like names and addresses and banking authorisations and also things that Ben would need to train me on. What’s next for Bean Ninjas? It will be sad to see to see Ben go, and at the same time this is an exciting time for our business. Have you survived a challenging business partnership, or have you got any questions on this topic? Feel free to share below.